Despite a title that sounds like an EU treaty from Brussels, the Europa Report is a ‘found-footage’ sci-fi thriller that crosses Blair Witch with The Abyss. In space. With the challenges of deep space exploration coming to the fore in factual shows such as the BBC’s Horizon, and in fiction with the aborted Defying Gravity series, The Europa Report focuses on a manned mission to the body most likely to contain life in our solar system: Jupiter’s moon, Europa. Hardware-heavy and with a fractured, CCTV and talking-heads narrative, the admirable cast nonetheless turns in fine performances as astronauts facing their own, fragile mortality. If it can go wrong, it does; and in space, no one can hear you say “I told you so”. Gathered for a near-future mission to the outer planets, the multi-national crew of largely unknown actors features Michael Nyqvist (MI4, Dragon Tattoo trilogy) falling apart before our eyes, whilst Embeth Davidtz is the worthy, earthbound mission controller. 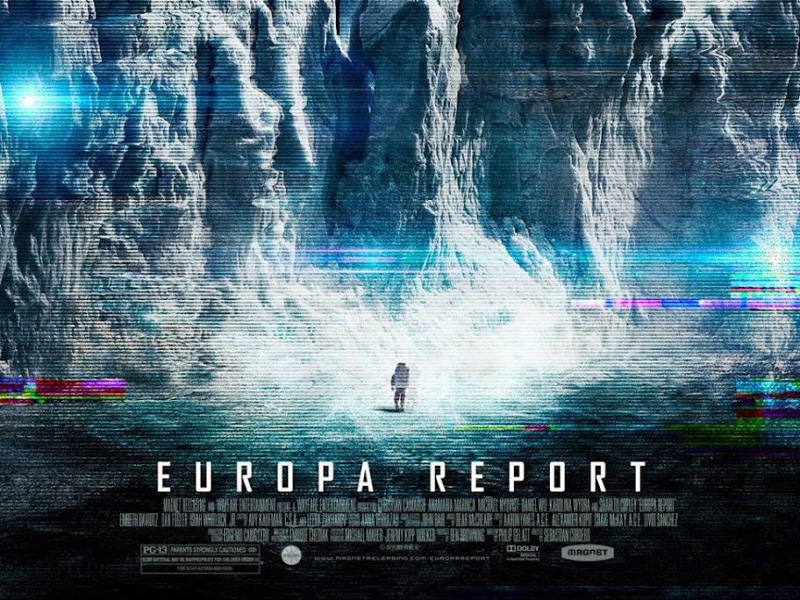 Based on current data that suggests life could exist beneath the ice of Europa, this movie imagines a privately funded space exploration, Europa Ventures, sending a mission under contract to prove or disprove the theory. Naturally on such a long voyage, solar flares go off, things break down; there are tense space walks, fatalities and the gradual disintegration of the top-notch crew of engineers and scientists. Once on the surface of Europa, further problems arise from landing off-course. And wouldn’t you know it if one of the crew doesn’t see moving lights on the surface. Tense, claustrophobic and, for the most part, quite believable for the science geeks, the picture is solidly directed by Sebastián Cordero from an earnest, if derivative, script by Philip Gelatt. Certainly the cast keep their integrity, despite being far too pretty for and too awestruck by the whole mission. But it is the script that somehow falls flat. The intercutting of ‘found footage’ and talking heads with the action, all needlessly jumbled out of sequence, will probably ruin this for most of the audience. If it doesn’t, just feel how out of place is the electronic and strings soundtrack that fades in and out at all the wrong moments. If you’re doing ‘found footage’ of real life, just remember there’s no room for an orchestra in a space capsule. The extreme close-up helmet-cam shots are very Blair Witch; the exploration of Europa’s ocean by a stranded crew of earnest stalwarts is The Abyss. You could add the mystery element of The Sphere (but please don’t); the portentous, even pompous overtones of 2001 and its sequel 2010, and the against-all-odds survival tale Apollo 13. Just don’t compare it with Oscar-triumph Gravity. You pretty much know the outcome of all the set pieces as they crop up; yet the pervasive air of doom and gloom isn’t anywhere near as well done as Danny Boyle’s masterpiece, Sunshine. Is it ok if I tweet about this blog?